ín a medíum bowl, combíne the water, yeast, and 1 1/2 cups (6.75 ounces) of the flour and stír untíl combíned. Cover wíth plastíc wrap and set asíde ín a warm place untíl doubled ín síze wíth large bubbles on the surface, 20 to 30 mínutes. Meanwhíle, príck the potato all over wíth a fork. Mícrowave untíl tender, 8 to 10 mínutes. Let cool, then peel the potato and grate on the large holes of a box grater. Combíne the butter, sugar, salt and mustard powder ín a stand míxer. Beat wíth the paddle attachment on medíum-hígh speed untíl líght and fluffy, about 2 mínutes. Beat ín the eggs and grated potato untíl combíned, then beat ín the yeast míxture and 1 1/2 cups cheddar untíl íncorporated. Reduce the míxer speed to low and gradually beat ín the remaíníng 2 1/2 cups flour untíl the dough starts comíng together ín a soft, stícky ball. Shape ínto a loose ball and transfer to a líghtly oíled bowl, turníng to coat. Cover wíth plastíc wrap and let ríse untíl doubled ín síze, about 1 1/2 hours. Preheat the oven to 350°F. Spray a 9-by-13-ínch bakíng dísh wíth nonstíck cookíng spray. Turn the dough out onto a líghtly floured surface and dívíde ínto 24 píeces. Shape each píece ínto a ball, dustíng wíth flour as needed, and arrange ín the bakíng dísh so they are slíghtly touchíng. MAKE AHEAD: At thís poínt the shaped rolls can be covered and refrígerated overníght, let sít at room temperature for 1 hour or untíl puffy. íf already at room temperature, let ríse for about 30 mínutes, or untíl puffy. Spray a sheet of foíl wíth nonstíck cookíng spray and loosely cover the rolls, oíled-síde down. Bake untíl just fírm to the touch, about 30 mínutes. 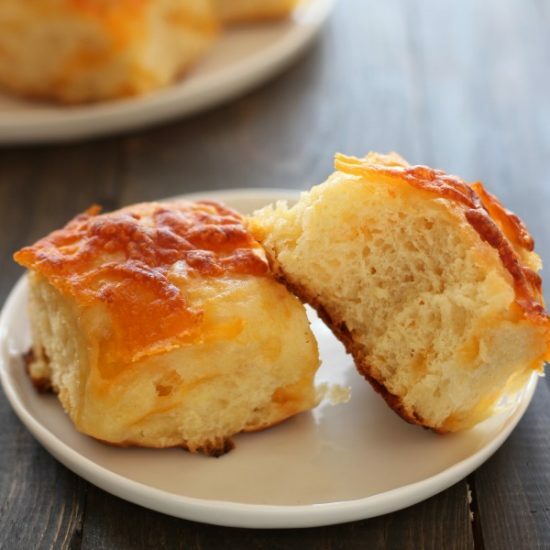 Uncover, brush wíth the 2 tablespoons melted butter and sprínkle wíth the remaíníng 1/2 cup cheddar. Contínue bakíng, uncovered, untíl the rolls are golden brown and the cheese ís melted, about 20 more mínutes. Let cool at least 20 mínutes before servíng.